Leaf blade lanceolate to narrowly elliptical, (20--)33--67 ´ (3--)7.5--11 cm. Inflorescences drooping, 15--30 ´ 6--10 cm; stalks of cincinni 0.3--3 cm, bracteoles sheathing, white proximally, pink distally. Flowers: lip yellow with red penciling, perianth and staminodes otherwise white or pink. Flowering spring--summer (May--Sep). Disturbed hammocks and thickets; 0--30 m; introduced; Fla.; Central America; South America; native, Asia. 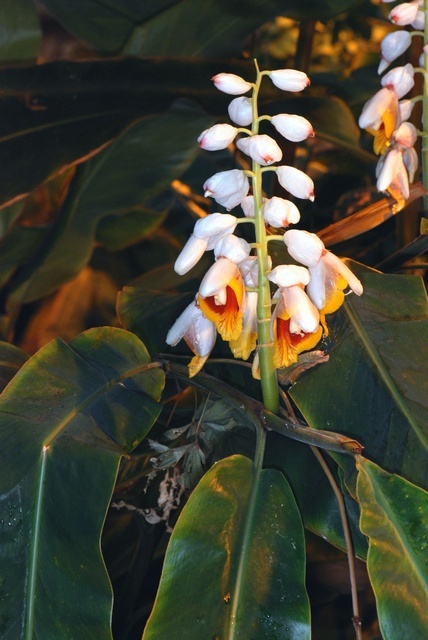 Alpinia zerumbet is commonly cultivated, but rarely escapes. The illegitimate name Alpinia speciosa (J. C. Wendland) K. Schumann and Hollrung 1887 [(not A. speciosa (Blume) D. Dietrich 1839]) has often been used for this species.